Dog vomiting diarrhea could be a sign of something simple such as food intolerance or a severe problem that requires immediate veterinary care. If a dog appears in pain, bloated, has recently received medications or appears lethargic, or has bloody vomit or diarrhea, then it makes sense to immediately consult a veterinarian. If there was a change in diet or if a dog ingested something simple such as grass, then if the symptoms subside in 24 hours, a veterinary consultation is in order however, the problem is probably minor in nature. The mechanism that controls vomiting in mammals is controlled by a center in the hind brain. In general, it is a coordinated phenomenon involving the gastrointestinal tract , the musculoskeletal system and the nervous system. Expulsion of contents is usually directly controlled by the vomit center or nerve supply in the abdomen, in a chemoreceptor trigger zone (CTZ). Diarrhea and vomiting together can be serious particularly if you can see a significant amount of blood in either one. If the vomit is yellow, then it could be a symptom of a problem with the gallbladder. If your dog is having severe abdominal pain, is vomiting and has diarrhea and has taken aspirin or ibuprofen, extreme weakness, fever or lethargy, then consult with a veterinarian immediately, particularly if the diarrhea and/or vomiting has lasted more than 24 hours. The same advice goes if your dog has eaten something that may be blocking the digestive system or if there was a possibility that poison was ingested such as taking in antifreeze from the street. If the stomach is swollen and heaving, call the veterinarian as this might be bloat, a life threatening condition. The primary cause of any dog vomiting problem is usually an issue in the gastrointestinal tract. Problems may involve other factors such as renal failure (kidneys), hepatic problems (liver), imbalanced electrolytes in the blood, canine pancreatitis and poisoning. Different generalized diseases, which directly or indirectly involve the gastrointestinal tract are considered the primary cause of vomiting, even though the entire mechanism is controlled by the nervous system. Poisoning is one common examples, where toxins are ingested, which triggers or stimulates the vomit center in the brain. Similarly any inflammation or infection in the gastrointestinal tract can lead to vomiting; such as canine parvovirus disease and canine distemper disease. Some diseases like a disturbance in the electrolyte balance, inflammation in surrounding organs such as the spleen, liver, pancreas etc can cause stimulation of the abdominal nerve supply, resulting in vomiting. Diarrhea refers to a general increase in intestinal motility (spontaneous movement). The dog diarrhea can be differentiated as either small or large intestine diarrhea based on the different signs and symptoms that are specific for either form, such as urgency, contents, anemia, and frequency. Cause of Dog Diarrhea; Dog diarrhea may be caused by parasites, bacteria, a virus, nutritional disorders, food poisoning and by ingesting toxins or poisons. Diarrhea can be further characterized by whether it is expelled with hypersecretion (excessive liquids), is osmotic (through pressure) and increased permeability (how solid or liquid is the diarrhea). All of them represent different levels and forms of diarrhea a dog can experience. Parasites like hookworms, roundworms, giardia and coccidian can cause diarrhea. Some parasites are associated with specific symptoms. Bloody diarrhea can be caused by coccidian, while worm infestations can result in anemia. Bacterial and viral infections are some of the common contagious forms of dog diarrhea. E. coli, Salmonella and Clostridia are some common bacterial species which causes diarrhea. Similarly, canine parvovirus disease and canine distemper are viral diseases considered to be causative agents for dog diarrhea. Digestive system disturbances can be caused by a change in diet and brands and nutritional disorders such as food poisonings. Some toxins such as heavy metals, poisons and garbage such as plastic if ingested can also be a cause of dog diarrhea. Feeding a dog table scraps, particularly when they have a sensitive stomach, can cause diarrhea and vomiting. 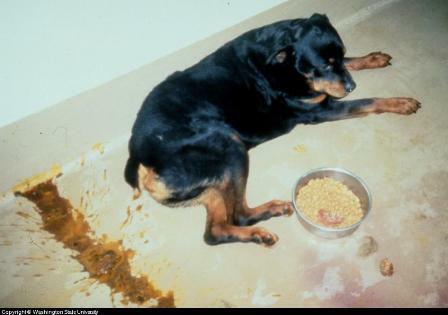 In most of cases, dog vomiting diarrhea exists as part of the same condition. Even though both symptoms are the result of different mechanisms in the body, it shows that any problem in the gastrointestinal tract can trigger all or some of mechanisms associated with dog vomiting diarrhea, individually or in combination. Dog Vomiting Diarrhea can be caused by Salmon Poisoning Disease. It occurs when a dog ingest fish such as Salmon and others that swim upstream which contain a parasite that can be fatal to dogs. Source: Dr. John Gorham, Washington State University. If dog vomiting diarrhea exists at the same time, it suggests that a dog is experiencing a more severe condition. History is the most important factor; history of nutrition, duration of the problem and habits. Clinically, a veterinarian will examine the contents of the vomit and diarrhea. it will be thoroughly examined for color, consistency, the presence of blood, volume & frequency. Several tests are necessary to confirm the cause, including a stool flotation test, culturing of stool microbes, antibody–antigen relation tests, PCV and Hb Level tests. In any of form, diarrhea, vomiting or both, dehydration should be noted and treated with care. Before treatment, a veterinarian needs to determine the level of dehydration and its association with the overall body condition. Initially, before treatment begins a dog must be rehydrated. This is ever more important if a dog experiences vomiting and diarrhea in combination, as the level of water and fluids falls more rapidly when these symptoms are combined. In this context, a dog must not be given any oral preparations, food and fluids. Fluid therapy should be the priority of the treatment plan. Ringer’s Lactate solution 5% is considered most effective, administered via IV (in a vein) or SC (under the skin), until the dog recovers most of its body fluids. Focus on the symptoms is the focus of the next phase of treatment. Anti–emetic drugs, which may inhibit vomiting, act as an anti-spasmodic, and will depress the nervous activity related to vomiting. Similarly anti–diarrheal drugs which can suppress the recognized mechanism of diarrhea can be used. Specific treatment for dog vomiting diarrhea should also be carried out to eliminate the underlying cause of the dog vomiting and diarrhea. Different Antibiotics (Sulfa drugs, Gentamicin etc), Anti protozoal drugs (Metronidazole), Antihelmintics (Mebendazole, Febantel, Febandazole etc), Anti – spasmodic (scopolamine) etc can be used depending on the cause. If a dog has a sensitive stomach, or could benefit from added digestive support, a homeopathic remedy such as RunniPoo Relief or Digestive Support. Herbal and homeopathic ingredients such as Plantain, Lady's Mantle, Podophyllum and natural ingredients like sulhur all can help to firm up stools and restore healthy bowel functioning, but only after more severe symptoms are addressed by a veterinarian.